Last weekend, February 19–21, was one that all members of our THON/Philanthropy Committee had been patiently awaiting — the chance to finally see all of our hard work come alive for 46 hours in the Bryce Jordan Center. This year marked excitement and anxiousness for some members experiencing their first THON, as well as appreciation and anticipation for those members who were experiencing their last. After patiently waiting among the chaos of thousands of student volunteers lined up outside the BJC, we settled in the stands and there we remained for the duration of the weekend in support of our dancers, THON Chair Maya Doumit and Vice-President Jessica Savarase. 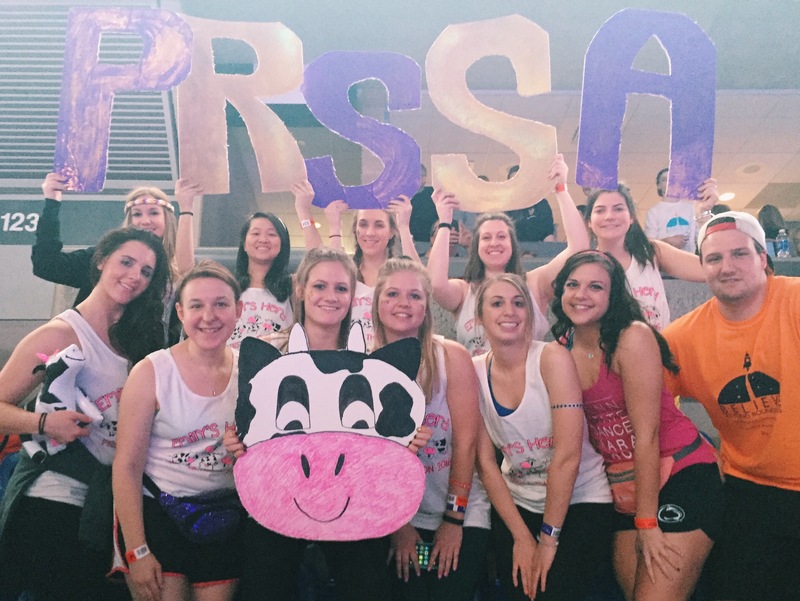 The weekend was an amazing experience, and many members said that this was one of their top THON experiences. Members all agreed that iconic THON activities like the line dance, student-athlete pep rally, live music performances, and simply getting to spend more time with our favorite little girl, Emily Whitehead, and her family, made it a hard THON to top. Emily was a real trooper on Sunday and even decided to stand for the duration of the event on Sunday with our dancers, who had done a phenomenal job thus far in their 46-hour journey. We were all so proud of Emily’s determination and maturity in seeing what THON is really about. It makes PRSSA so thankful and blessed to have been able to be on this journey with Emily, and to see her grow is the most rewarding thing we could all ask for. We were so proud of our members in the stands as well, as many stayed for most, or all, of the entire 46-hour duration, playing games and dancing. As always, Family Hour was definitely an emotional one, but it reminded us all of why we THON, and why we are so proud to be Penn Staters. Our dancers made it to the end and still looked just as beautiful and determined to make a difference as they did on Friday evening. Overall, Penn State students raised $9,770,332.32 for THON and the Four Diamonds, which will benefit pediatric cancer research, therapies, and support Four Diamonds families. We are EXTREMELY proud of this total, but even more so of our own contribution as our members surpassed last year’s fundraising total and raised $16,299.40 For The Kids! “Emily’s Herd” had a great THON weekend, and we want to sincerely thank everyone who has given their support this year. Also, we thank our THON chairs and senior members who will be graduating in the spring. We could not have asked for better friends or role models to have by our sides this THON weekend. We look forward to doing more fun events with the Whiteheads, and to starting preparations for THON 2017. Cold Stone Fundraiser Benefitting THON on Oct. 17!